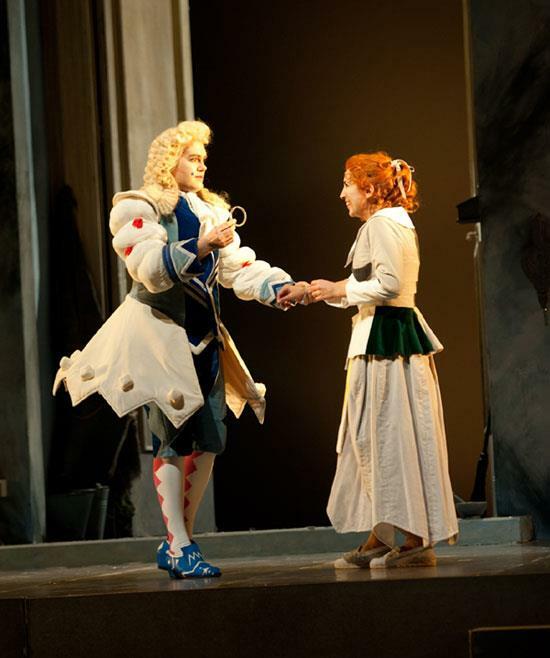 Karin Mushegain (left, photo by Elise Bakketun) sang Cinderella’s famous opera-concluding aria in audition for Speight Jenkins, Seattle Opera’s General Director, in December 2012 in New York. It went well; but she never expected she’d be flying to Seattle a week later to make her Seattle Opera debut in her favorite role. 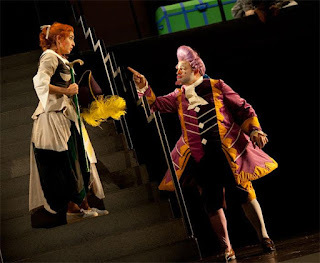 An unexpected cancellation, just a day or two before rehearsals were to begin, had left Seattle Opera without a mezzo soprano for three of the January performances of this Rossini comedy. Luckily for all concerned, Ms. Mushegain was able to re-arrange her schedule, join Seattle Opera for the production, and share her gifts and talents with our audience. She makes her debut this afternoon. I spoke with her a few weeks ago about coloratura technique, her summer in France, and how Cinderella might be avenged on an unsupportive childhood music teacher. Welcome to Seattle Opera! First things first, would you pronounce your name for us? Yes, it’s Armenian, and my last name is pronounced as if it were “-ian,” but it’s spelled differently because when my great-grandfather and his three brothers emigrated here, they each got a different spelling and each kept it. ‘Cause they didn’t know how to tell them how to spell it. So they kept it. But I’ve had people call opera companies, all offended, and say, “You spelled her name wrong!” But no, that’s how I spell it. 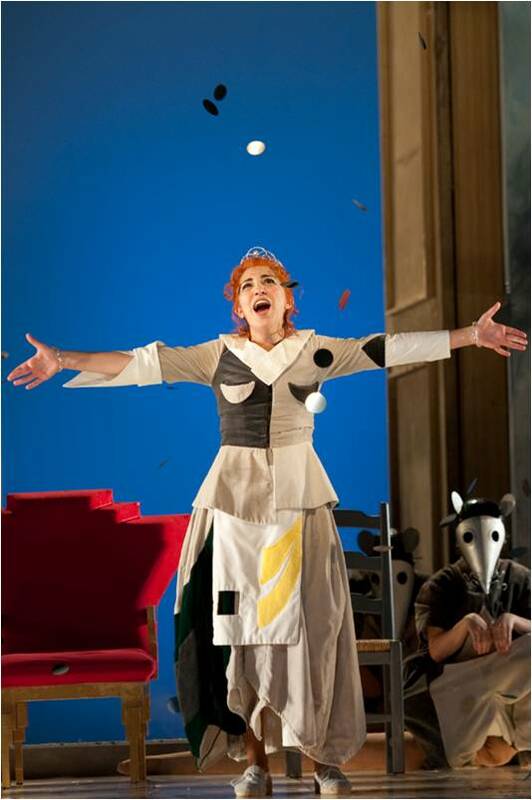 Okay, so tell us a little about your background, where you’re from, and how you got started in opera? I was born in raised in Pasadena, California, and like a lot of singers always sang when I was little. I got kicked out of piano lessons as a little kid because I wanted to sing the songs, instead of play them. I started taking voice lessons very young, when I was 11, because my music teacher at school had made fun of my voice, in front of the whole class, and I had stopped singing. So my mom put me in voice lessons, so I would start singing again! What happened to the music teacher? She still works there, I think. My family used to send her letters...you know, every time I was in a new opera, they’d send the program there! Send it along to the higher-ups, get her fired. No, nobody wanted bad karma, they just wanted to make her feel bad. Armenian family, you know, we like to make people feel guilty. [laughs] So yes, later I went to Northwestern University, and studied both vocal performance and musical theater there. I moved to New York on September 1, 2001, and ten days later everything changed, and Broadway closed down, so then I went back to school, to UCLA, and started refocusing on opera. Both, but their musical theater program is so phenomenal, studying acting and dancing every single day. But I finished the opera program at UCLA, and then went to Pittsburgh to be a Young Artist. Now, you made your European debut this last summer. Yes, in France in this lovely little company called Lyrique-en-mer, on a tiny little island, Belle-Isle, in the Bay of Biscay. The nearest part of France is Brittany. All farms, all rural, and it was nice because no one spoke English. You really had to immerse yourself in French and French culture, which was fun. Did you speak French very well before you got there? I speak French poorly. I did Rosetta Stone before I went there, to prepare myself, and it’s amazing, it really helps. I’m very thankful I did it. The role I’m doing here, Angelina [aka Cenerentola] in La Cenerentola. Now, it looks like you’ve been singing a fair amount of Tisbes, too. I have, I sang the wicked mezzo sister with Glimmerglass and with Florida Grand. 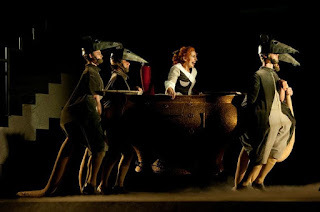 Altogether I’ve done 23 or 24 performances of this opera. Did you learn Cenerentola’s arias while you were singing Tisbe? It definitely helped, it helped hearing it all the time. And at Glimmerglass I was covering Cenerentola, so I really learned it then. The cover cast had a performance onstage, with orchestra and costumes and sets and everything. Which character is more fun to do? Good question. 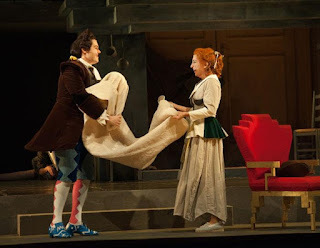 Tisbe is more fun to play, but Cenerentola is more fun to sing. And she’s more interesting, she has a bigger journey. Tisbe doesn’t really change over the course of the opera...she’s pretty stagnant. But it seems like such a fun role to do, because she’s such a twit! She’s so fun, and I also love having a partner onstage, that’s a blast. It’s like they’re twins, you always have your buddy there. 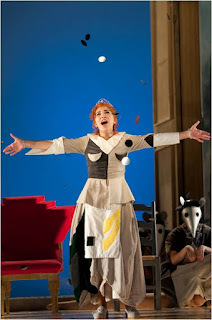 But not as much fun to sing, since you don’t have quite so much of the amazing coloratura that Cenerentola gets to do. Was it hard to get it into your voice, the first time? I really think you’re either born to sing coloratura, or you’re born to sing legato, and you have to learn to do the other. And my voice naturally does coloratura. But yes, the thing that’s tricky about this is there are so many runs, and they’re all just a little different. You have to have a road map. I do all my runs by number: 1, 2, 3, 4, 1, 2, 3, 4 [demonstrates singing a coloratura run]. My whole score is all numbers, written out, and I’m thinking those numbers as I’m singing it. You may hear, “Vengo, vengo, ve-e-e-e-e-e-e-e-e-ngo” but I’m thinking “1-2-3-4, 1-2-3-4, 1...” in my head. Yes, my voice teacher, Juliana Gondek, taught me that. “You obviously know how to sing coloratura,” she said, “but it’s messy at times, and this is how you clean it up.” And you can’t mess it up when you’re thinking the numbers. That’s how my brain works: I like to organize it and have a map. She has been. That’s why I love Joan’s direction, he wants her very calm and in control at every moment. Even when she first meets Ramiro, and gets all flustered? Well, he allows that, but he’s constantly reminding me that I need to be calmer and more collected. Which is interesting—I’ve played her a bit more frantic, because I think that’s how I am, internally, and so it’s been a nice way to rediscover her, as a calmer, tranquil person. Yes, and with her family. I love how she teases them when they come back from the ball: “Oh, why did you have such a bad night?” I love it when she’s ballsy and gusty. But she never loses herself. At the end, when she forgives her family and tells the prince, “If you love me, this is the time not to stoop to their level, but to let goodness triumph.” She’s herself the whole time, but she increases in strength over the course of the opera. 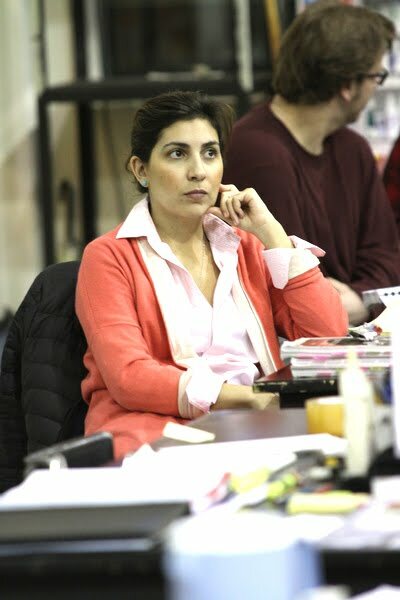 And it’s Alidoro who makes all that possible for her. I think so. She’s never had anyone 100% on her side before. This is someone who has shown up for her, just for her. I mean, does that not get to you? Is that not the prettiest line in the whole opera? It’s a bit like “Una furtiva lagrima,” the pretty tenor aria in Elixir of Love. Something dark in the midst of this very, very happy, bright, major-key piece. Yeah, and it’s one of those wonderful frozen bel canto moments, where nothing else is happening—and those musical phrases wrap up exactly what she’s feeling every day. Well, we look forward to hearing you sing it toi this afternoon!